A drawing by Paris opera costume designer Charles Bianchini of Sieglind's costume from 1893. Jeanne Hatto would go on to play the role in 1904. 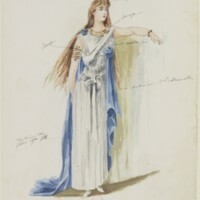 Charles Bianchini , “The Valkyrie: nineteen models of costumes by Charles Bianchini: Sieglinde,” Théâtrophonics, accessed April 19, 2019, http://theatrophonics.org/items/show/76.